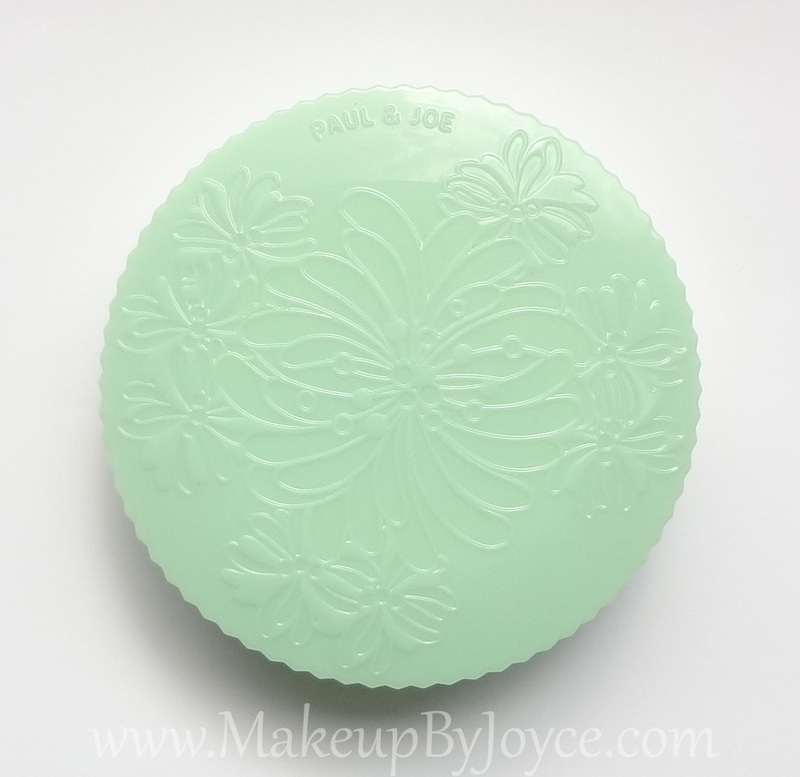 Packaging: The mint-green compact is embossed with a beautiful floral design on the outside and a lovely butterfly on the inside. It also comes with a small mirror and a plastic cover that separates the powder from the mini travel brush, which is convenient and sanitary. 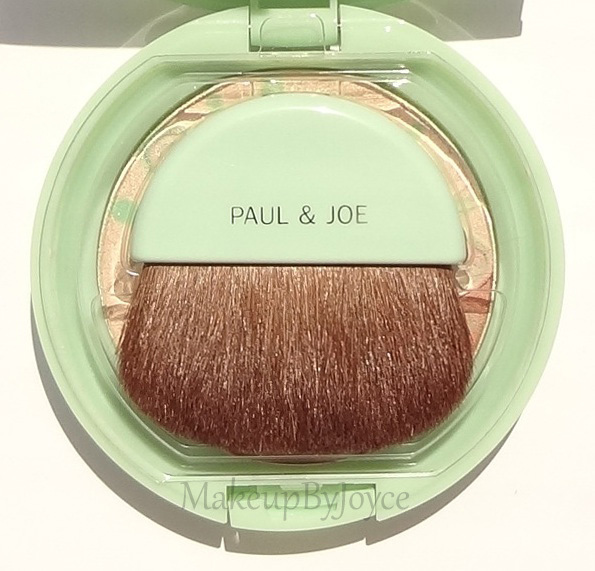 The brush is actually useful and is one of the most softest mini brushes that I have felt. 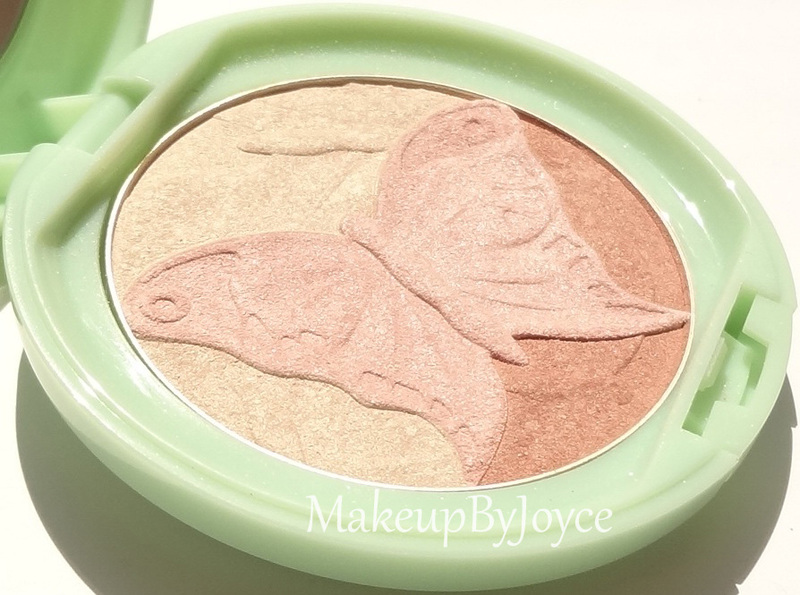 It's not too flimsy or too dense and it's just the perfect size for applying highlight on top of the cheek bones. 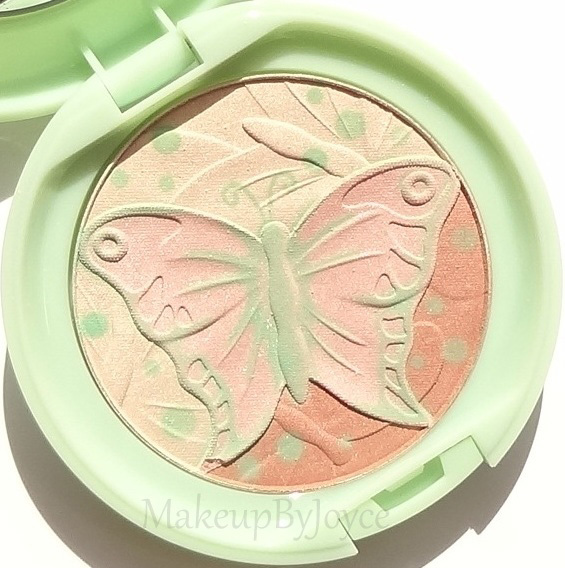 The Shimmering Pressed Powder G consists of 3 main shades, including a beige, pink and peachy bronze shade, with a mint-green overspray that disappears after a few swipes. 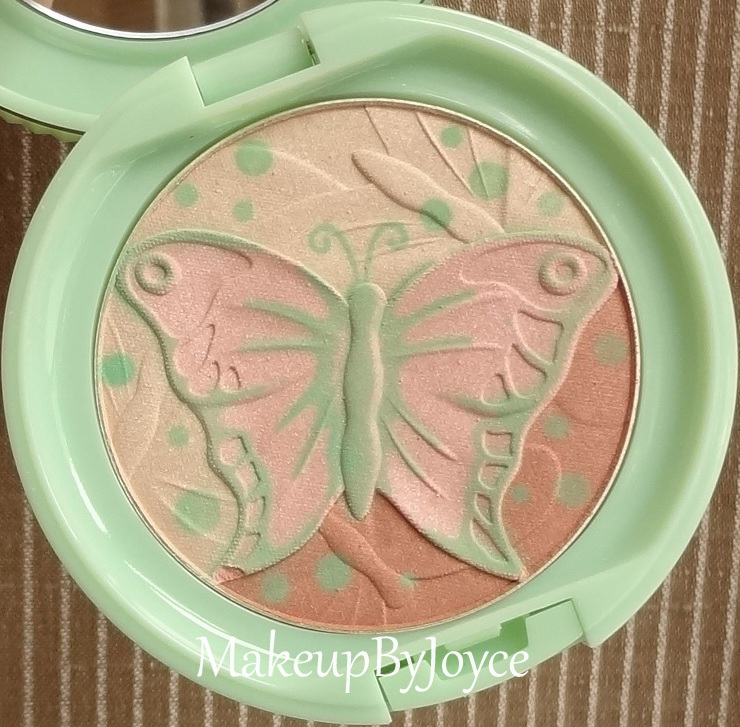 The pink shade is too light to use as a blusher for my NC30/35 skin tone and although the peachy bronze shade looks gorgeous, it's too difficult to pick up the color individually with a face brush. 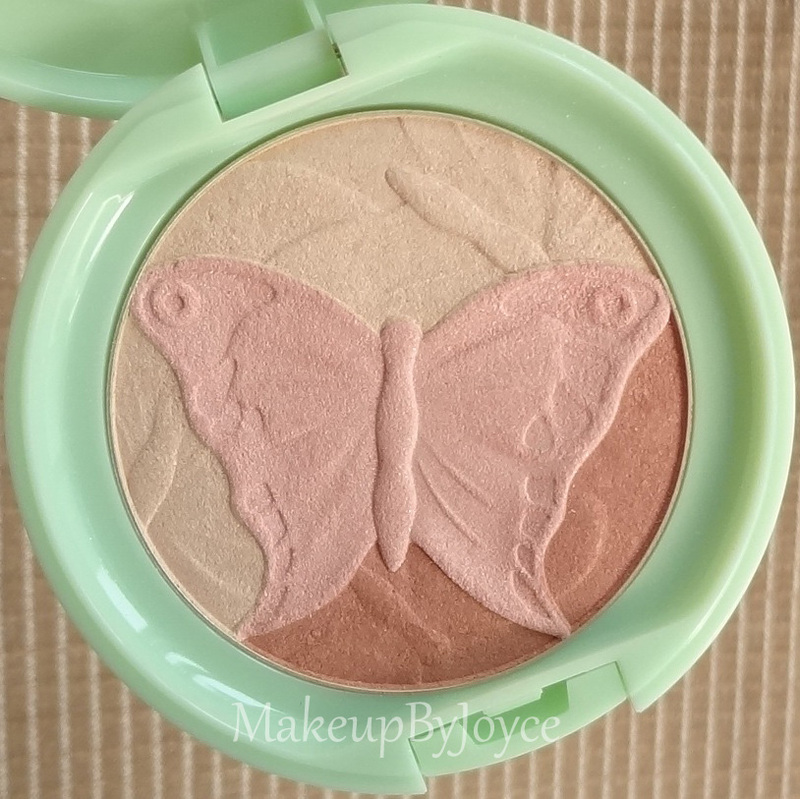 When I swirl all the colors together and apply it onto my cheeks without a blusher underneath, it translates into a light pinky beige shade that looks quite chalky. 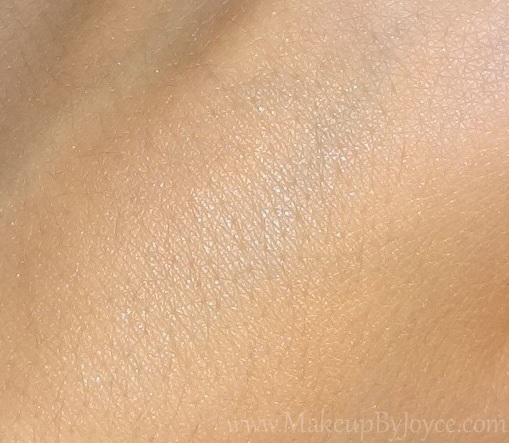 When worn over a blusher, it adds an extremely subtle sheen to the skin and leaves a ton of micro-glitter particles all over my cheeks that transfer to other parts of my face throughout the day. The sheen is hardly noticeable because the tiny sparkles are so distracting. I don't recommend wearing this during the day unless you want to look like a disco ball. However, the sparkles do look pretty on the decollete and chest area. So, I would reserve this for the night time and for special occasions when you want to look glitzy and glam. The glitters are very tiny and they don't feel chunky or gritty at all. However, the powder feels too soft. The design can chip away easily if you don't use a light hand to pick the product up with a brush. If you look at the 8th picture above, then you'll notice that the corners of the left wing are chipped away and flat. 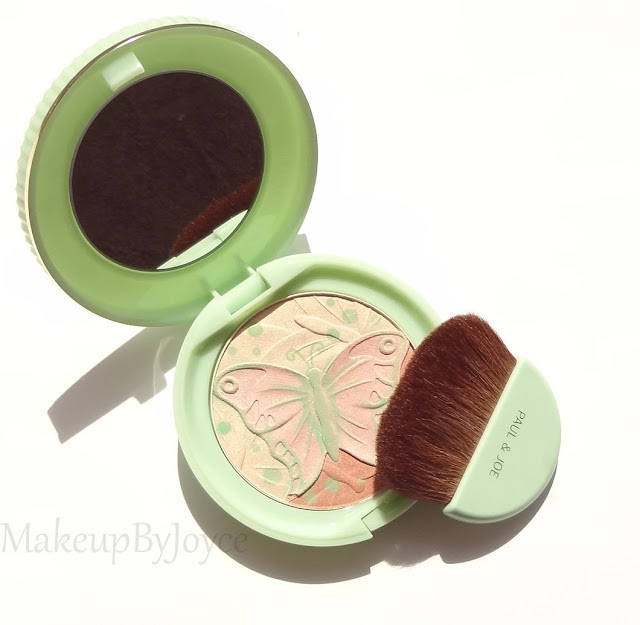 The powder is really delicate, so you have to be really careful and I definitely don't recommend travelling with this. 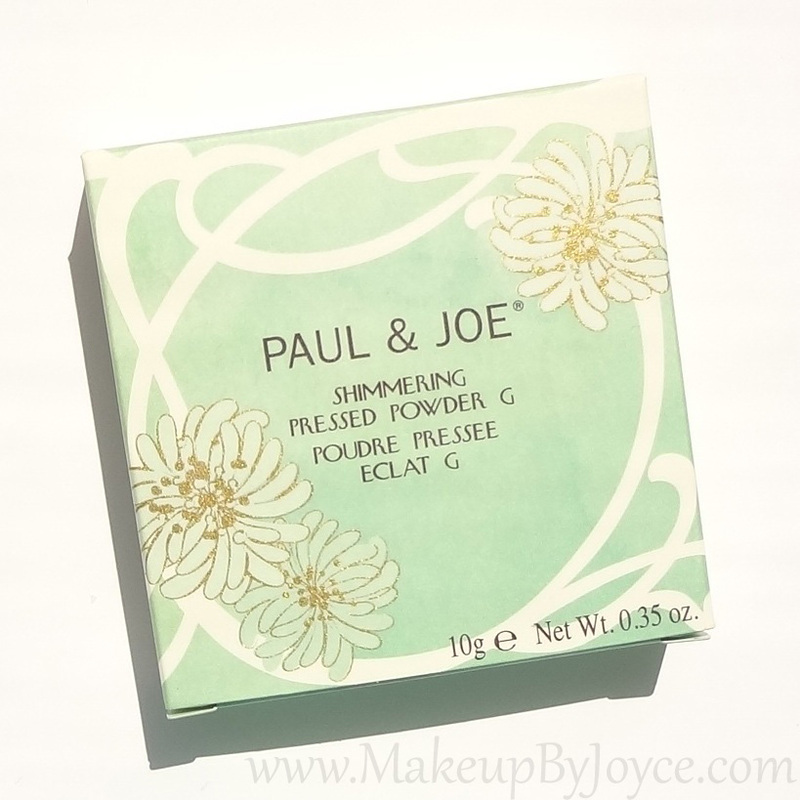 Bottom Line: The Paul & Joe Shimmering Pressed Powder G is not a true highlighter because it doesn't add a noticeable glow or a sheen to the skin (unless you take flash photography), but if you love to sparkle in glitter, then you'll love this powder. Also, it looks so lovely as a decor for your vanity. I can't even imagine that you would want to use this and ruin the gorgeous design! Did you get anything from the Paul & Joe Summer 2012 collection? Beautiful exquisite packaging. I like the way it shimmers.